Sign Your Statement of Support Now! With only weeks until the Wyoming State Legislature gavels in on February 12, you and I don’t have much time. Legislator in BOTH parties are anxious to wrap up business quickly, so they can get home and start campaigning for the 2018 primaries and General Election. That’s why I’m counting on you to help me put the State Legislature on notice that Wyoming’s Second Amendment supporters are DEMANDING passage of the Wyoming Stand-Your-Ground Bill. Not next year. Not when they “feel” like throwing Wyoming’s Second Amendment supporters another bone. BUT NOW. So can I count on you to please sign the ‘Statement of Support’ for Stand-Your-Ground that I’ll provide you in just a moment? As you’ll see, this simple ‘Statement of Support’ shows every state legislator know that you’ll be watching for their support — or lack of support — for Stand-Your-Ground in the upcoming legislative session. The fact is, Wyoming has gone without Stand-Your-Ground for far too long. 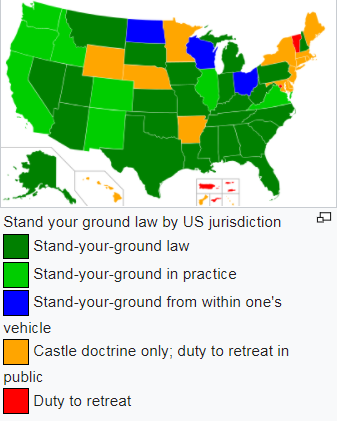 As you can see from this map, every single state in the mainland U.S. that’s west of the Dakotas has a Stand-Your-Ground Law — either by statute or court precedence! Even California does. Yet, Wyoming doesn’t? I hope you agree that this is flat-out unacceptable. And if you do, it’s time to give your state legislators an earful about it! Stand-Your-Ground law — which State Senator Anthony Bouchard will be introducing in the next legislative session — would simply state that law-abiding Wyoming gun owners can defend themselves against criminal attack without fear of being targeted by an anti-gun prosecutor. Face no so-called “duty to retreat.” Under current Wyoming law, you are required to try to get away from a criminal attacker before being able to legally use self-defense to protect yourself. In a situation where your life is on the line, the LAST thing you want to be thinking about is what some anti-gun judge or prosecutor might say. Receive criminal immunity from anti-gun prosecutors. In other words, no more anti-gun prosecutors trying to make an example of you — or taking a case to court to make a political statement. Receive civil immunity. That means the money-grubbing family of some thug you had to defend yourself against can’t come after you in court and sue you for millions! Without each piece of this three-legged stool — which Wyoming citizens DO NOT currently enjoy — those who defend themselves are effectively sitting ducks. If you agree that this is absolutely unacceptable, please sign your ‘Statement of Support’ for Stand-Your-Ground law at once! As it stands, every year — from Cheyenne to Cody, and Rock Springs to Laramie — law-abiding gun owners face the prospect of being prosecuted for simply defending themselves! After all, whenever some criminal commits some horrific crime, don’t the gun-grabbers always rush to place blame — not on the criminals themselves — but on law-abiding gun owners? So is it really any surprise Wyoming law doesn’t explicitly protect gun owners — even when it’s your safety at stake? I don’t know about you, but I believe the law should put the interests of law-abiding Wyoming citizens ahead of common thugs and criminals. A vast majority of Wyoming citizens agree. Despite this, gun-grabbers have so far succeeded in derailing passage of Stand-Your-Ground. But if you and I can turn up the heat once again, I believe we can FORCE every member of the Wyoming Legislature on record for or against Stand-Your-Ground as soon as they get back in session. That starts with your signed ‘Statement of Support’ so please sign your statement NOW! Many politicians in Cheyenne who are normally weak-kneed on Second Amendment issues believe the political winds are blowing against them in 2018. They’re going to be very worried about losing their seats in 2018. They know that angering the overwhelming majority of Wyoming citizens who support our Second Amendment freedoms is one sure ticket to defeat. That’s why — if you and I turn up the heat — and DEMAND passage of Stand-Your-Ground, many state legislators will realize they have no choice but to act. During heated election years, like 2018 is expected to be, many politicians could start to “see the light” and realize the simple truth that they work for us — not the other way around. But it won’t happen if I can’t count on your signed ‘Statement of Support’ today. So please take action at once! My goal is to generate a flood of these to place on politicians’ desks the day the 2018 session of the Wyoming State Legislature is sworn in. >>> Radio and Internet ads, if I can raise the resources, which I’ll unleash just as the vote comes to a head. With just weeks until the State Legislature goes back into session, this plan has to start now. So please, if at all possible, help put this plan into action with your most generous contribution of $100 today. I know that’s a lot to ask for. But time is very short. Of course, if it’s just too much, please consider $50 or at least $25 today. Wyoming has gone far too long without Stand-Your-Ground. It’s time for a change. If you agree, please sign your ‘Statement of Support’ letting your State Representative and Senator know you mean business on Stand-Your-Ground! P.S. If passed, Stand-Your-Ground would simply state that law-abiding Wyoming gun owners can defend themselves against criminal attack without fear of being targeted by some anti-gun prosecutor. And with the 2018 session of the State Legislature just weeks away, it’s time to DEMAND our legislators heed the will of their constituents and vote to pass it! So please sign your Stand-Your-Ground ‘Statement of Support’ right away! And when you are finished, please include a generous contribution of $100, $50 or at least $25 to help us mobilize as many grassroots gun owners as possible!